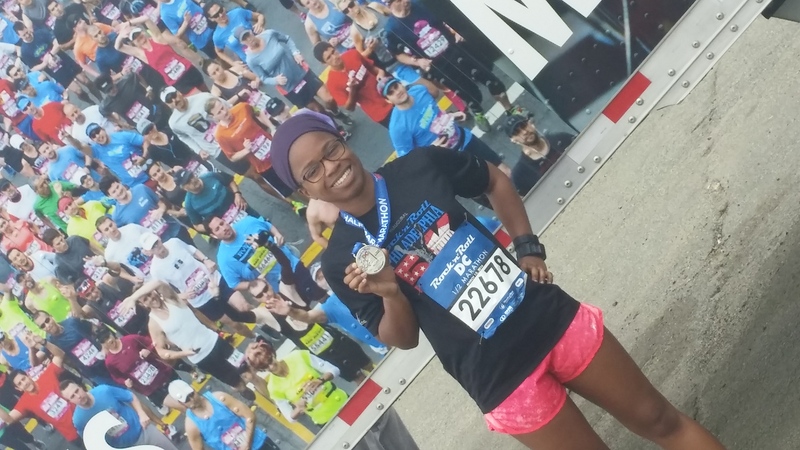 I ran a half marathon last weekend. And for the first time, I didn’t specifically train for it. 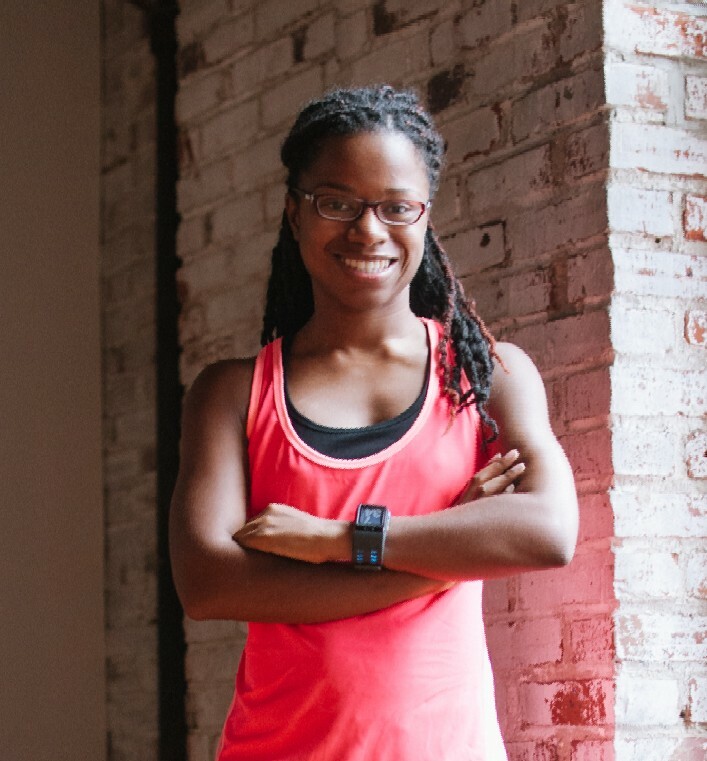 If you saw my goals that I shared for the Rock N Roll DC Half Marathon, you know that I was all kinds of nervous about this race for that very reason. I’m happy to say that I ran the entire race with a smile on my face! 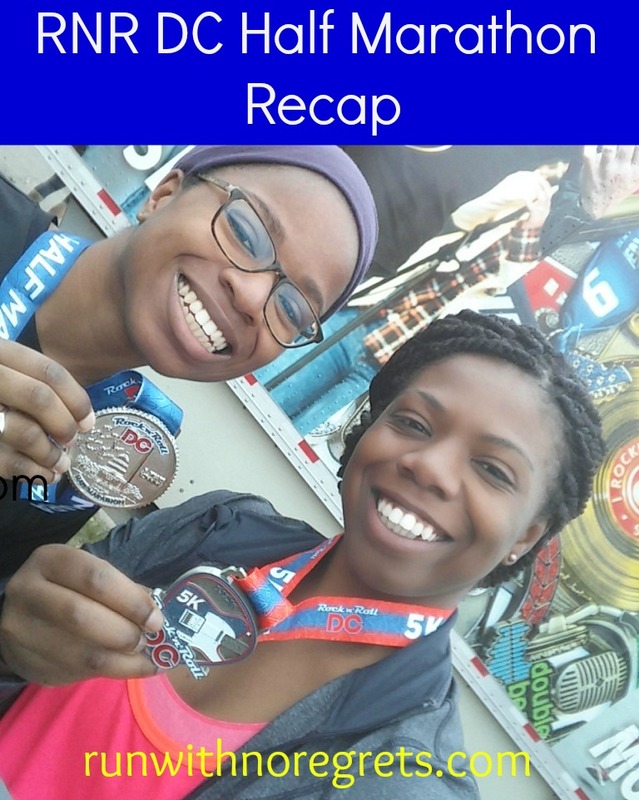 I’m sharing my recap with Tuesdays on the Run, hosted by Erika, Patty, and Marcia! The theme this week is “The hardest part about running”. 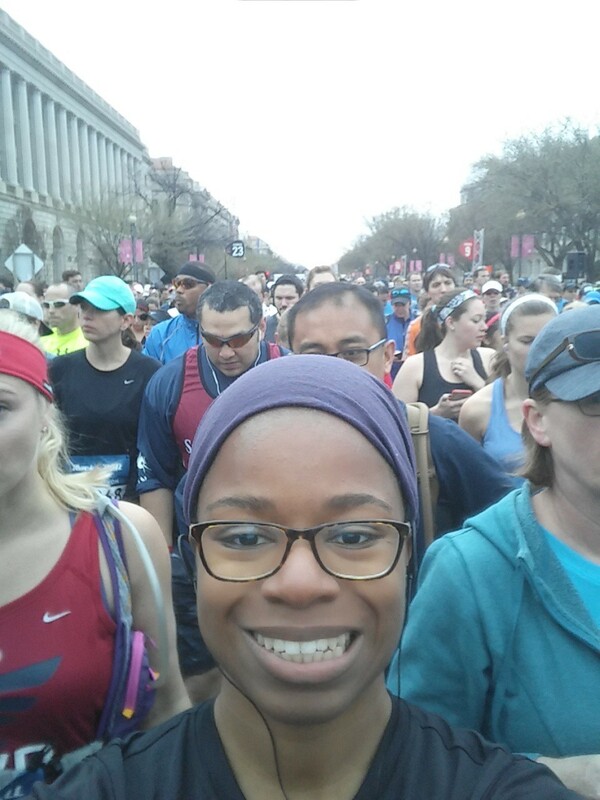 I can definitely say that PACING is a big challenge for me when it comes to running, and it was such an important part of the RNR DC Half Marathon! Let me tell you all about it! 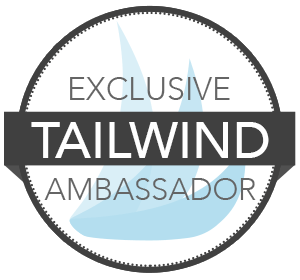 First, before I get into the recap, since I am a 2016 Rock ‘N Blogger, I was able to participate in this race with my complimentary TourPass Global. I was responsible for my own travel expenses. 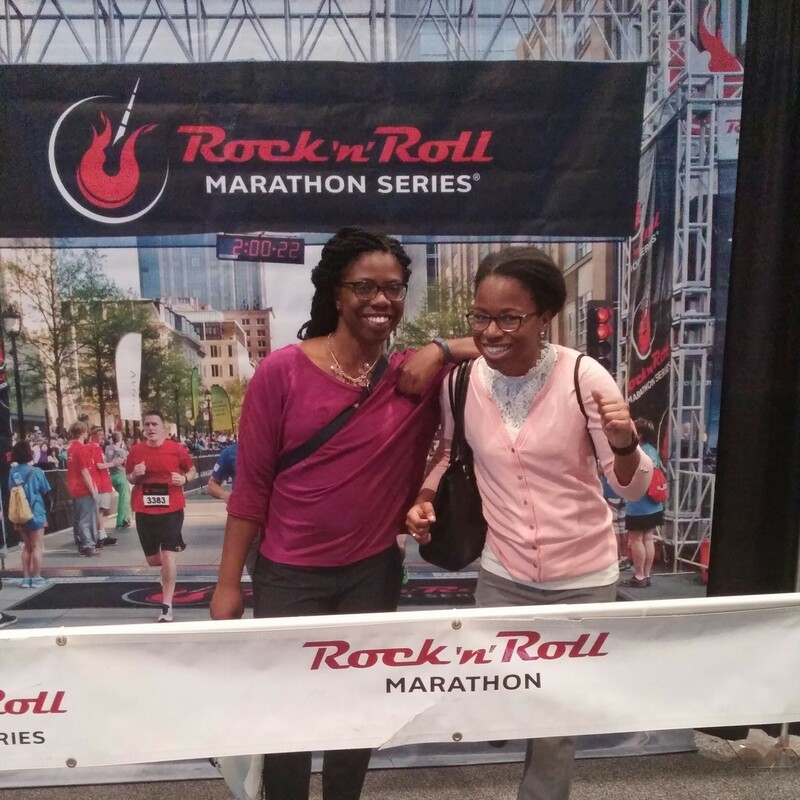 Once I was accepted into Rock ‘N Blogger, I started to look into which races I could attend this year. 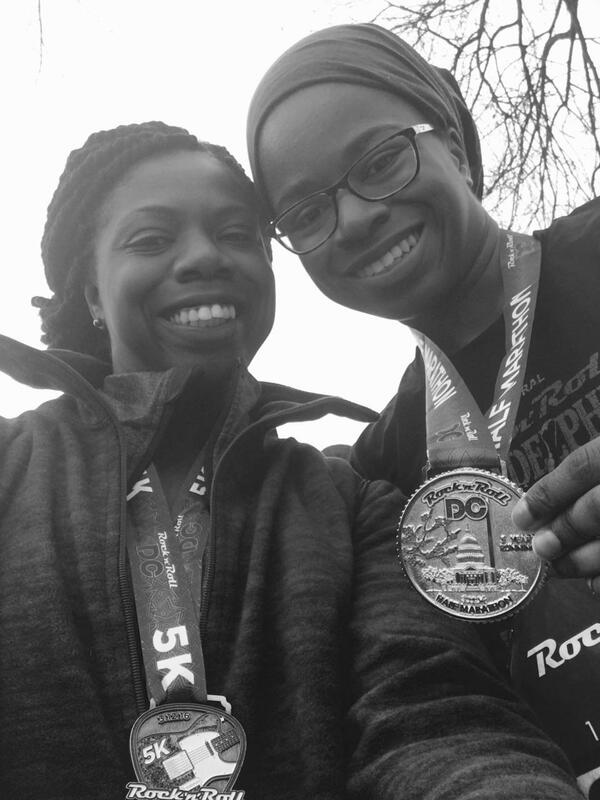 The DC half marathon turned out to work out perfectly. I had a work conference in DC from Wednesday through Friday and then I could enjoy the race on Saturday and stay with my brother who lives in the area. I even got my sister to join in the fun and sign up for the 5K! My conference ended at noon on Friday and my sister picked me up from the hotel so we could have lunch before going to the Race Expo at the DC Armory. 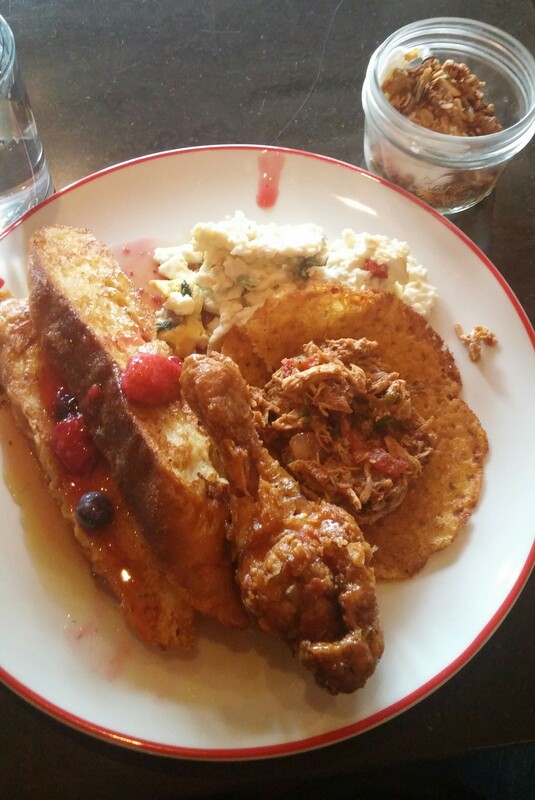 It was a good time to catch up and eat delicious food at Busboys and Poets. Traffic, as you could imagine, was a nightmare. It took forever to get to the Expo and we were completely at a loss on how to get to the free parking lot. Fortunately, one of the security officers gave us directions. I think we made it inside at around 3:30 pm. The DC Armory is a pretty cool building, but it was a little strange going into a basement to pick up our bib and T-shirt. Of course, when I received my shirt, the size small was WAY too small. Lesson learned…always pick a size medium! Jennifer and I wandered a bit around the expo, which was a lot smaller than I thought it would be. I really wanted to buy something cute at the Expo because RNR always has quality stuff from Brooks. Unfortunately, I was pretty uninspired by the selection and ended up getting a beer glass and a standard long-sleeved tech shirt that was a decent price. 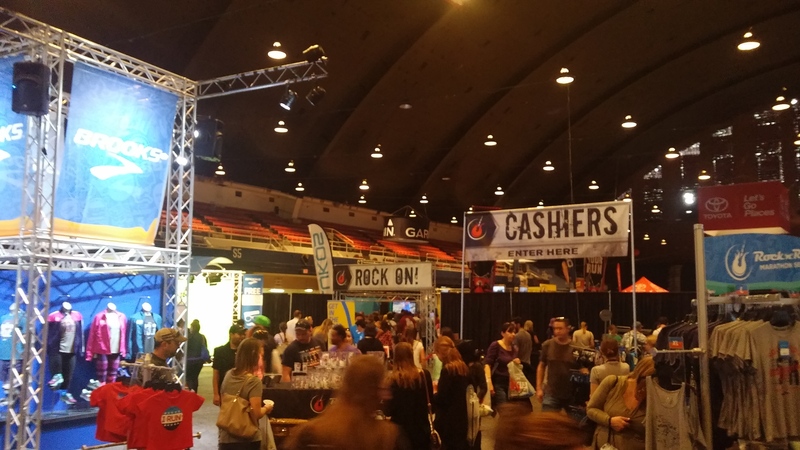 At 4:30, there was a scheduled meetup of Rock ‘N Bloggers and #WeRunSocial near the Rock ‘N Roll booth. I didn’t see anyone I recognized at first, so I shyly went up to some people who looked like running bloggers, lol. Finally, I got to chatting, and was so excited to finally meet Kathryn from Dancing to Running! I also finally got to meet Cynthia from You Signed Up for What! They are both also fellow ZOOMA Ambassadors. Everyone was full of great energy and it was really nice to be a part of the group. Photo with the Rock ‘N Bloggers! I packed a bag with my Tiger Tail (to loosen my muscles post-race), a pair of pants, and my race shirt so that I could exchange it for a size medium at the Finisher’s Festival. 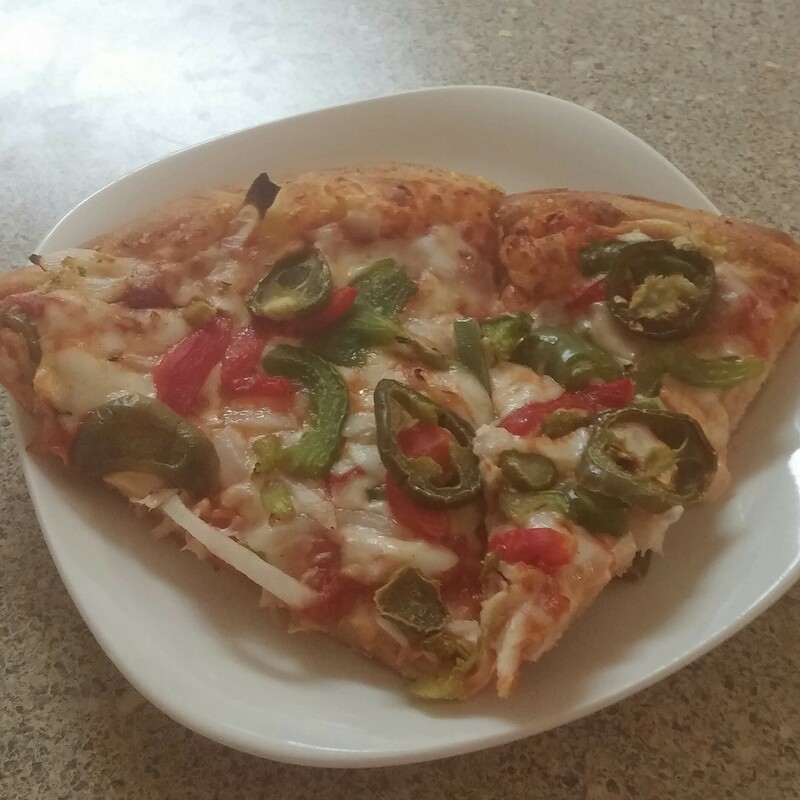 I didn’t have much of an appetite since lunch was pretty filling, but I had a few slices of pizza from Domino’s for dinner. It hit the spot! I ended up getting to bed sometime after 11 pm. I woke up a little after 5 am. I had my routine breakfast of toast and strawberry jam and made sure to hydrate before heading out. I originally planned to take the Metro to the race, but my brother offered to drive me there. That was such a relief, and it probably took only 20 minutes! I got to the race area a little bit before 7 am. I made sure to drop off my bag at the gear check before the 7:20 cut-off. They had several UPS trucks arranged by alphabetical order that they would drive to the finish. I thought that was pretty cool! It was about 7:10 and I had to go to the bathroom. Let me tell you, this was the LONGEST line I have ever seen at a race. My line had to have 50 people in it and there were SEVERAL lines that were just as long. And of course, it was chilly and breezy while I waited. It was probably about 7:45 by the time I was able to get to the bathroom. 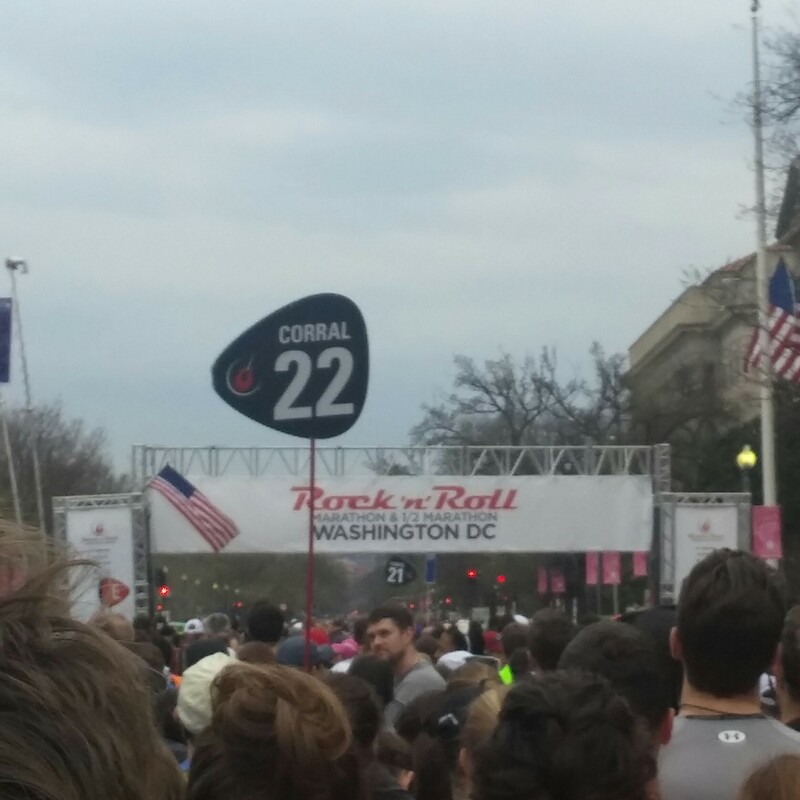 I was assigned to corral 22. By the time I got to the starting line, they were already calling corral 9 to get ready to take off. Oh well. It was pretty chilly (upper 40’s?) so I was looking forward to standing in a crowd in order to take advantage of some body heat. My battery life was around 58% so I made sure to wait before I started listening to my Spotify playlist. Finally, it was time to get going and start the race! Such a long wait to get started! I was really excited to get going in the race but I remembered my #1 goal: PACE MYSELF! This was just a training run. No getting swept in the crowd. I have to stay in control! So I took it easy and enjoyed my surroundings. I listened to a Spotify playlist with music from the 2000’s (my favorite era – pre 2010). While it was cloudy out, the sights were beautiful. I really enjoyed seeing the monuments and the trees that already had cherry blossoms. I quickly realized how many areas of DC I’ve never seen, and we were just getting started! My watch was a little bit ahead of the mile markers, but overall they seemed pretty consistent. At some point after mile 2, I felt a few rain drops. I was nervous that we’d have a repeat of the 2015 race, which was a complete washout. Thankfully, that was all there was to it! I fueled with my Clif Shot Bloks every 3 miles and made sure to drink my water when needed. Shortly after mile 4, my FitBit clocked 10,000 steps. It seemed like the race was going by so fast! I’ve never felt anything like it! I knew that I was in the zone and I wanted to keep it that way! Splits: Very consistent! 10:38, 10:38, 10:34, 10:20, 10:43. I knew that a big hill was coming so I was out on the alert. I tried to run conservatively leading up to the hill so that I wouldn’t have to walk it. When I saw the hill coming up ahead, I braced myself. Then I saw that it was designated as the “Blue Mile”. There were signs with photos of veterans who died serving our country. And on the left side of the road, there were several people wearing blue and carrying large American flags. It was a really inspiring and humbling experience and as I climbed that hill, I knew I had to keep pushing. I’m so proud that I made it to the top without walking because it was SO steep and long! After that hill, all the others that followed seemed like child’s play! Of course around 9 miles in the race, I started feeling discomfort in my fourth toe on my right foot. My sock was bunching in my shoe. Darn it!! I knew that it could possibly form some kind of blister, but there was no stopping me. Runners are used to the pain! When I got to mile 10 I was really excited. I was going for my longest run of 2016 and I was feeling like a rock star (oops, pun not intended!). Splits: My slowest was 11:30 at mile 6 on that extremely tough hill. Otherwise, I was still in the same range as the first few miles. 10:37, 11:23, 10:48, 10:30, 10:19. Finally, this is where I where I felt comfortable to push the limits and try for race pace. I could almost taste the finish line, yet at the same time, I wasn’t in a hurry to get the race over with. I was really enjoying myself! Usually by mile 8 or so, I’m feeling a bit of dread/fatigue. Not this race. I really surprised myself with how strong I felt. You may also like: Penn Relays and Nominated for a Liebster Award! I knew that Courtney would be on the left side of the course near mile 12, so I was looking forward to seeing her. The last time we met, I was struggling HARD…and I did not want that to be the case again. This time, I was all smiles, and our quick embrace was captured by the photographer. When I got to mile 13, I really wanted to get it over with. Whenever I see the finish line, I’m ready to surge! My sister was supposed to be on the right side at mile 13 but I didn’t see her. I kept running faster and faster, dodging people and trying not to trip on the barriers. I was SO happy to finish the race. I felt victorious!! Splits: I made it into the low 10-minute range and as fast as 9:30 at the end! 9:30, 9:52, 9:28, 7:59 (last 0.3 miles). My official finishing time was 2:17:53. My Nike+ watch had 13.32 miles in 2:17:57, which seems pretty accurate to me! I was SO happy to finish better than my goal of 2:25, and I even beat my original anticipated goal of 2:20! I have NOTHING to complain about on this run! I was able to check out my race photos very quickly and this is the first time I got so many photos! Just check out the Finisher’s Zone and search bib 22678 – you’ll see in all of my pictures, I look pretty happy! That means I’ll be buying a bunch of them! After the race, I wandered off to take an official race finish photo and try to find Jennifer. We finally met up after I picked up my bag from the UPS truck. She saw me heading to the finish, but she said I was going so fast she couldn’t get my picture! Jennifer sounded so worried about barely being able to finish in an hour, and she ended up getting a PR and finishing under 40 minutes! I’m so happy for her! This pic is like famous now, lol! The layout of the Finisher’s Festival was really confusing, maybe I went the wrong way, but I only got water and chocolate milk. I didn’t see where any of the food was being distributed. My knees really felt abused from running on all that pavement, so I was ready to get off my feet and relax. Since I can’t drink, there was no point to going to the Beer Tent. After a long walk to the car, I rolled my legs with the Tiger Tail, put on some flip flops and my lounging pants, and we were outa there! 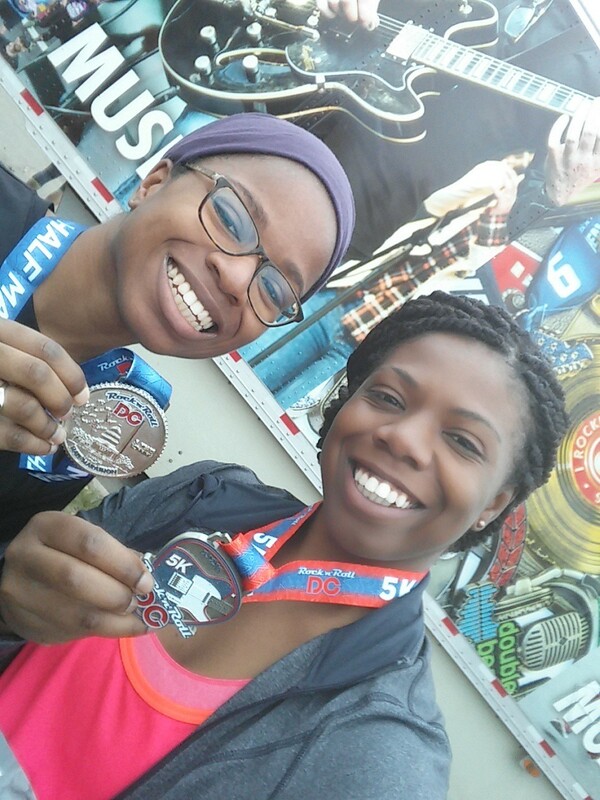 Unfortunately, I didn’t get to see a few people during or after the race, like Mar or Erika, then after the fact, I found out that an old friend from college ran it as her first half marathon! It’s always tough to get coordinated when there are so many people at a race. Hopefully, there will be another opportunity to get together later in the year! We got to my brother’s place and I cleaned up before we headed to Farmers Fishers Bakers for buffet brunch. It was my first time going there and WOW the food was amazing and really affordable! Why can’t we have nice places like that in Philly? It was a feast for champions! 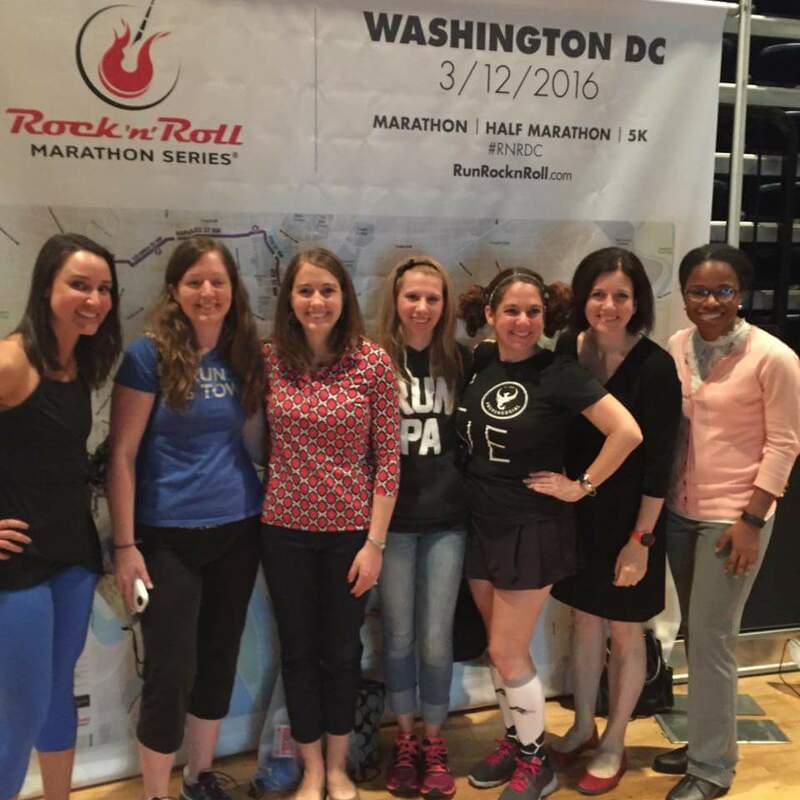 I had an incredible time at the Rock N Roll DC Half Marathon! It truly exceeded my expectations and I was so happy to have such a great performance in this race! I do have a few critiques, but nothing that would deter me from running this race again! Fantastic course! I was in awe as I ran the streets of DC. I loved running past the monuments, along the river, Rock Creek, and under so many beautiful bridges. Sure, there were a few rough spots, but I live in Philly, so I’m used to that! There was such a variety in what we saw. Great course support. The volunteers did a great job keeping runners fueled and hydrated. And the spectators cheering outside their homes were so much fun, blowing bubbles and waving signs! “This race is YUGE!” While there were a few quiet spots, I never felt stuck in a “dead zone”. The bands along the way were fun too. Pre-race food. I’ve never seen a race that offers bananas and water before the race. I didn’t partake, but it was very thoughtful! VIP privileges. I didn’t get the VIP package, but they had it REALLY good. They had massages, tables set with flowers to enjoy a nice post-race meal, and preferential potties and parking. I get to do one VIP race this year so I need to figure out where! Not too crowded. 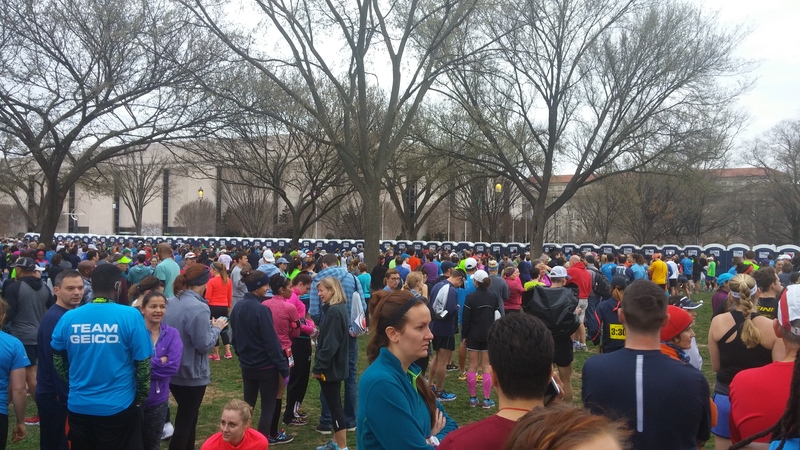 When I ran the Cherry Blossom in DC last year, the crowd was just AWFUL for the entire race. RNR DC seemed to have a lot more runners but overall, the spacing worked out well. It’s just when you want to speed up when people get in your way! The streets that we ran through weren’t too narrow either. Efficient gear check. Dropping off and picking up my bag was easy, it was just hard on my knees to go down a hill to pick up my stuff after the race. There’s free beer. And I’m not just talking about the Beer Tent at the Finisher’s Festival, but along the course at more than one point! Some people even gave out margaritas! I’m still abstaining from drinking for Lent, so I wasn’t able to enjoy this perk. Amazing medals! While I loved the Cherry Blossom medal last year, this is by far my favorite medal ever, and it’s pretty heavy! Consistent brand. I really like the Rock ‘N Roll brand and I appreciated that the organization of the DC race felt very familiar to me because I’ve run RNR Philly. Not enough potties available before the race. I’m glad I only had to pee because otherwise I would have been in BIG trouble that morning! Fortunately, they had plenty of potties along the course. The Expo was just okay. Granted, I’m not a big fan of expos, I prefer to be in and out. I was a little disappointed in some of the T-shirt designs this year, but I was happy to get some new ProCompression socks for free! Post-race area was confusing and unattractive. It wasn’t clear to me how to get around once you finished the race. The Finisher’s Zone seemed to be split in half, and honestly, the location left much to be desired. The DC streets are a bit hazardous! You really have to watch your step and avoid the potholes! I never heard the featured band. I finished the race before 10:30 and I never heard Tower of Power or any other acts on the big stage. Technical difficulties? First, I have to give a thank you to Rock N Roll for giving me the opportunity to be a part of their blogger team and participate in this race. I had such a wonderful time and I’m so happy I got to meet up with a few of the Rock ‘N Bloggers! This was a race that really felt like a family affair. I’m so happy that my sister was able to PR in her 5K and earn a fantastic medal (I mean it’s gorgeous!)! I was also happy to spend time with my brother and his twins. The hospitality was MUCH appreciated. And we had a great time at brunch and just hanging out on Saturday. I’m glad we were able to have that quality time. Next, all 3 of us need to schedule a race for 2017! Last, I want to thank you for reading and supporting me!! I received so much positivity leading up to this race, and you know how nervous I can get about things. I’m grateful that I was able to just go out there and run and not have any worries, PLUS have a successful race! All of the likes, comments, and messages were just so kind and I carried that with me. Thanks again! Regardless of my time, this was the best race that I’ve had in AGES. Everything felt right and my body and I were in perfect harmony. Those are the moments when I remember why I love to run. I felt the same joy at my very first half at Rock ‘N Roll Philly in 2011. Maybe Rock ‘N Roll races give me a little magic? And now, it’s all over, and training for the Cherry Blossom 10 Mile Run continues! It’s only 2.5 weeks away until I’m back in DC! When was the last time you had a “perfect” race?